Well, here it is, the full jacket of The Whispering Mime, due for release mid-December. The first proof arrived on my doorstep this week and it looks wonderful. The Kindle version will be ready for Christmas. For those of you new to the site, this is the third book of The Renaissance Series, a loosely connected trilogy set in the Renaissance age. Each novel is a separate story, yet each references the others in many ways, and the characters in Tales of Yorr cross over to The Whispering Mime. Were these three men one in the same, or a figment of the imaginations of Elizabethan England? Follow William, born a Catholic, raised a Protestant, exiled to become a priest, as per his father’s wishes. Adventurer, poet, spy, assassin and lover, with an imagination that defied the conventions of his time, and a name easily confused, mis-signed, and misquoted. Ink never sleeps; it dries and haunts us forever. An ancient picture frame and a forgotten parchment lead two generations of one family into the world of Renaissance Florence. Both artefacts pose the same questions; were Sandro Botticelli and Simonetta Vespucci lovers? Do the women in his paintings, including The Birth of Venus, really depict the young Florentine beauty? Can any man love one woman so intently and for so long? Following in her footsteps, there will be a new addition to this site, the author interview page, which you will discover on the Fellow Authors link. The adventurous Charlie will be the first, sometime between now and Christmas. Tales of Yorr (2nd Edition) is now available. Re-formatted to match the smaller size of the second book in the Renaissance Series, Birth of Venus. The second book in the series will be released in the coming weeks. Birth of Venus explores the life of Sandro Botticelli and his supposed love, Simonetta Vespucci. I'm back from my tour of Japan, all documented on Twitter - click here. More importantly, The Whispering Mime was released today, so now you can buy the set - The Renaissance Series, books 1, 2, & 3. Click on the links and find yourself a paperback, in cream paper with glossy covers, or buy yourself an eBook. Below is the full set. Tales of Yorr, Birth of Venus & The Whispering Mime. Well, it has been a while, but the writers from The Gargoyle Chronicles have been busy writing and editing. Since the release of The Renaissance Series last year, the focus has been on editing a new work from Oznonymous - Sentenced to Obscurity. You can see the provisional full cover below. This novel is quite a departure from the historical fiction released last year. It is a work that spans three time periods, a futuristic dystopian sci-fi realm, a contemporary love story, and a historic fiction middle. The work involves a contemporary writer who has just completed work on a science fiction piece, which becomes part of the tale. That story, in turn, begins to relate his life, which plummets into the depths of despair; It is difficult to tell which book wrote which, but the unravelling of the mystery is a brain teaser for all who enjoy a good read. In keeping with the dual novel theme, the cover has two covers. The day has finally arrived to unleash the writer Oznonymous on the world. These Sci-Fi and black comedy musings will begin with a Dystopian Science Fiction novel titled Sentenced to Obscurity (scroll down to view the cover.) What begins as a contemporary love story, turns from mystery to futuristic nightmare in an intriguing web that spans three generations. Released on paperback and in eBook format today, this eclectic piece will surprise readers from pre-prologue to the final page. Do not miss your chance to be one of the first to read this epic tale. 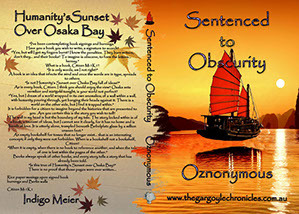 Click here to be transported via hover junk and view humanity's sunset over Osaka Bay. 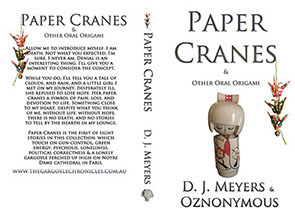 D J Meyers and Oznonymous have combined their talents over the past year and created a selection of short stories. 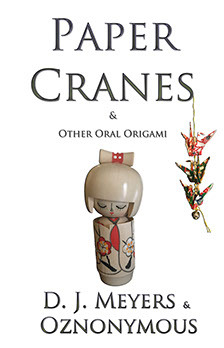 Now available on Amazon - click here - Paper Cranes & Other Oral Origami contains 8 works. From shorts to novella, the tales explore social issues from disarmament, marriage equality, the environment, psychosis, loneliness, the explosion of political correctness, and gun control. I was born beneath a lamington blanket on a pavlova pillow in Melbourne, Australia. A place about as far from anywhere in the world as you can get, unless you're familiar with a map of Tassie, which I'm sure you all are. My first book was a small adventure called Penny, that was in grade four. I spent many years afterwards writing songs, but the past ten years have been all about the novel. Why? Because it was there. So, what do I like. Hmmm... good question mysterious Internet user. Well, I majored in English and History, love a good shot of Sci-fi or a classic, and spend my spare time travelling the world. You'll find many of the ports I have visited depicted in the novels here, from Europe to Asia, Australia and Africa. A challenge is what I require when writing a book, a mystery of plot and a few multi-faceted characters. This eclecticism stems from my penchant for variety. I enjoy many things in many arenas and infuse my tales accordingly.